How much longer can you live in your existing home without sacrificing comfort, safety, accessibility and independence? Many people are facing tough decisions about moving out of their homes or investing in remodeling. Houses need to be designed so we can stay in them as long as possible, even when health conditions limit our mobility. Writing from experience, I know this situation all too well. Seven years ago my spinal cord injury left me in a much compromised condition. I came home from the hospital in a wheelchair and realized just how unaccommodating my two-story home was to me. A very steep wooden ramp had to be built to just to get me inside my house. Doors had to be removed in the bathroom, laundry room and shower because they were in the way of my wheelchair. My life change was sudden; for others life changes more gradually. People develop chronic conditions like arthritis, get shorter as they age, and have hip and knee replacements. For some, adaptive devices like walkers, canes and wheelchairs are needed. For others it becomes difficult or impossible to come into the home without help, due to the steps at the entrance. The microwave or storage areas above the kitchen counter may no longer be within reach. Faucets in the bathroom and kitchen may be too hard to turn on and off. Bathtubs pose a problem getting in and out. Showers and toileting areas have no grab bars to hold on to. If these scenarios are of a concern to you, universal design offers a solution for your next home or remodeling project. Universal design is a framework for the design of places benefiting the widest possible range of people in the widest range of situations without special or separate design. Universal design is human-centered. Environments designed utilizing these principles are usable by all people, to the greatest extent possible, without the need for adaptation or specialized design. Universal design homes need not look geriatric or hospital-like, but rather homey, spacious and welcoming for all. I am currently designing and building a universal design national demonstration living laboratory home in central Ohio. 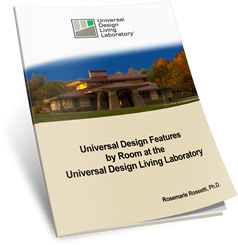 After much research and visiting homes that successfully integrated universal design principles, I recognize the benefits it can offer everyone who lives in a home. A shallow kitchen sink with a side-mounted faucet and rear drain. Adjustable height kitchen cabinets above counters. As you plan for your elder years or consider caring for aging relatives that will live with you, think about what features of your current home will limit accessibility and independence. 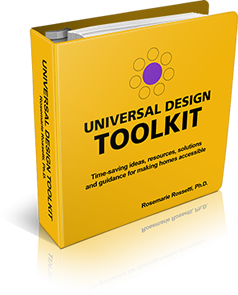 Call a builder or remodeler and begin a dialogue about their experience with universal design. Thoughtful planning may enable you or those you love many more years of quality life in a home that offers safety and comfort.